The LG Revolution on Verizon has an update on the way as build VZ910ZV9. Through the update, LG has patched a security hole, improved the phone application, and fixed some text message issues. More importantly though, Verizon mentioned their new “Remote Diagnostics” customer service tool again that has raised a few eyebrows in its short life. 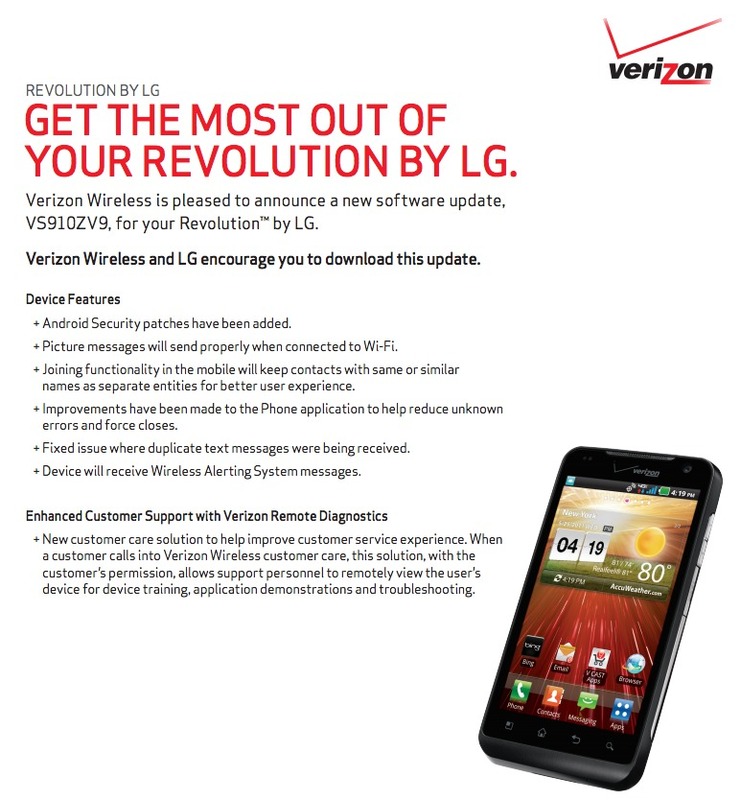 It first debuted on the Revolution back in March, so it is sort of odd to see them bring it up again here. We aren’t sure if they are improving it or making it as public as possible as to not freak out Revolution owners. Probably the latter. For those not familiar, this new Remote Diagnostics tool allows customer service agents to remotely access your phone when you call into them looking for help. They can’t do it unless you give them approval, but in a time where privacy is brought up on the daily, you can imagine how most of us feel about this tool being installed on our phones without our consent. Until we see an opt-in to even have it installed, we aren’t going to be friends. The update is 20.9MB in size. More info.